I went to the dollar store on Friday and found a writing pad where the top half has a place for a picture and the bottom half has a place for writing, so I grabbed it for Firecracker's writing practice. She is loving it and we were quite impressed with her first piece of work. Firecracker specializes in drawing people, so this is pretty good for her considering she's branching out a bit. She used the cover of her writing tablet for her inspiration for the drawing and the darker letters. We talked about how she would finish the sentence. 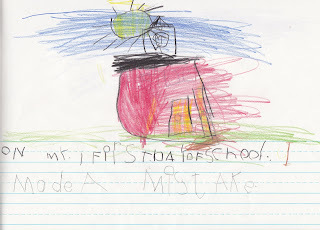 I encouraged her to write something about learning to read, but she insisted on writing the part about the mistake. She said her mistake was picking the flowers in front of the school without asking (which had happened in the Fancy Nancy book we'd read earlier in the evening.